There is nothing more exhilarating than trying something new. As soon as I got off the plane, I can feel a new atmosphere in Italy. It might be scary to some, including myself, to make that decision to spend a few weeks away from home. I decided to travel alone without any family or friends. Sometimes you just need to take that jump and I’m glad I decided to study abroad. Now I’m spending my first part of the summer at the John Felice Rome Center. I recently finished my first week of classes and this whole week is becoming a wonderful blur for me. 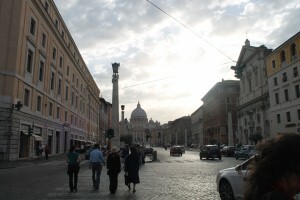 One day, I’m taking pictures of the Vatican. Another night, I’m grabbing a cup of gelato down the road with new friends from the JFRC. The next day, I’m strolling through Villa Borghese. Last night, I was able to enjoy some wood fired pizza for dinner with the other JFRC students. Hopefully, blogging will give me the opportunity to share my stories and allow others to get a glimpse on what it’s like to study abroad. For classes, I’m reading stories that are set in Italy (Exploring Fiction) and understanding the appreciation of beauty (Aesthetics). Since this is my first time in Rome, I still have so much to see of the city. I also plan to visit other parts of Italy such as Pompeii, Abruzzo, and Assisi. I am ready for more adventures to come!